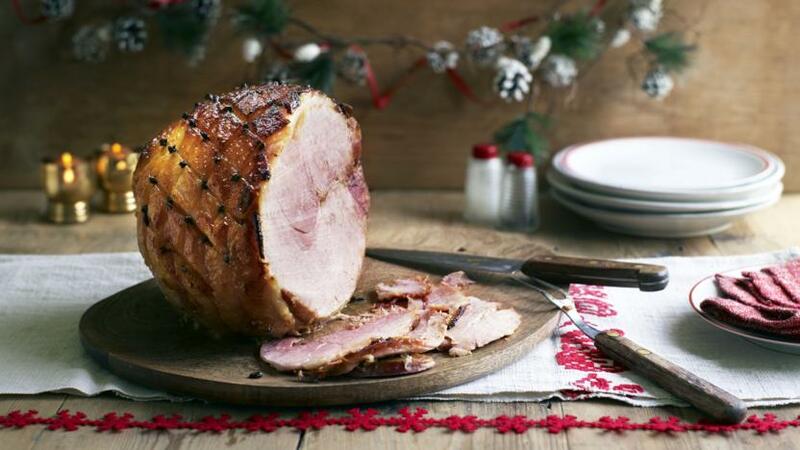 Of all our gammon recipes, this is a festive classic. The Hairy Bikers know this is a must-have for a Christmas party! Each serving provides 327 kcal, 36g protein, 10g carbohydrates (of which 10g sugars), 15.5g fat (of which 5g saturates), 1.5g fibre and 4.9g salt. Preheat the oven to 200C/180C Fan/Gas 6 and line a large roasting tin with kitchen foil. Use a small knife to remove the rind from the gammon joint, leaving as much of the fat intact as possible. Score the fat in a diamond pattern, and push a clove into the centre of each 'X'. Place the gammon into the foil-lined roasting tray, ensuring that the sides of the foil come halfway up the joint to contain any roasting juices. For the glaze, mix the honey and mustard together and brush half of it evenly over the gammon, including one side of the joint. Roast in the centre of the oven for 10 minutes, then take the joint out and brush the top and remaining side with the rest of the glaze. Return the gammon to the oven for a further 10– 15 minutes, rotating the tin so that the opposite side of the gammon faces the back of the oven. The gammon is ready when the fat on top is glossy and golden brown. Cover loosely with foil if the top begins to look too brown. Remove the gammon from the oven and set aside to rest for 15 minutes before carving. Pour any juices that have collected in the kitchen foil into a small pan, and warm through gently. Carve the gammon, serve on a large platter and spoon over the warmed juices . If the gammon is to be served cold, remove the joint from the fridge and allow to come to room temperature for 30 minutes.